Don't toss your puppy in to sink or swim. Although working retrievers usually do their most memorable work in water, water is not their natural environment. If you doubt that, check any retriever's head and neck area for gills. Like humans and all other land animals that sometimes plunge into the drink, retrievers must learn how to swim, preferably when they are small puppies. Helping a young dog master this skill is quite easy, although it takes planning and time. Unfortunately, many overly enthusiastic new dog owners unthinkingly rush their puppies into water in ways that frighten the youngsters of water rather than teach them to enjoy swimming. Far too many uninformed or misinformed puppy buyers think the little beast needs no water introduction because "retrievers swim naturally." This assumption can lead to a variety of serious mistakes. Such a person might take a new puppy to a pond and simply toss him in to see what happens. What almost always happens is the pup is terrified and might become permanently water-shy. A more compassionate ignoramus might carry his puppy out into deep water, and then drop the dog in, more or less gently. The results probably won't be quite as traumatic, but the puppy will still get a very bad first impression of water. Another uninformed neophyte puppy owner might decide that because retrievers are bred to retrieve from water, and since his new puppy is already retrieving in the backyard, the only sensible way to introduce him to water is with a pond retrieve. So he tosses a dummy out into deep water and sends his puppy. The puppy might wade out a little way, but as soon as his feet lose contact with the bottom, he'll splash frantically back to shore. If the boss becomes insistent, things can get ugly. If instead, he simply tries again and again, he is unknowingly training his pup to give him water refusals, which is a very bad habit. A really creative beginner can probably think of several other ways to prevent a puppy from developing a positive attitude toward water. However, the previous examples should give you a good idea of what to avoid. So let's focus on how to introduce your puppy to water in a way that will help him learn to swim and love doing it. Above all, you and your puppy must be bonded well. You must be his hero, the person he tags along with, the one he tries to please, or in technical canine jargon, his "pack leader." Lacking solid bonding, you won't ever train the dog to do much of anything. Then, too, the dog must be a normally healthy, active youngster that is comfortable riding in a vehicle. An unhealthy or carsick puppy makes a poor student. You need two types of water. First, you need a pond with a solid bottom and plenty of shallow puppy-wading water along the shoreline. Second, you need a lazy stream with a solid bottom and shallows along both shores, but with deeper puppy-swimming water in the middle. The deeper channel should vary from 5 to 15 yards wide. Don't introduce your puppy to water when either the air or water is cold. To keep yourself aware of the water temperature, you should wear old jeans and sneakers, not hip boots or chest waders. One thing you don't need -- and shouldn't have -- is any sort of retrieving dummy. Not even in your vehicle. Without one during your pup's introduction to water, you won't be tempted to do something really dumb such as tossing a dummy into the water to encourage him to swim. Start in a suitable pond. Because most puppies are cautious when first entering water, you (as your pup's pack leader) should wade in first and encourage him to follow. Wade in water so shallow that his feet will never lose contact with the bottom. He'll wade in just to be with you. When he does, praise him lavishly, stoop down and pet him, and then start wading around again, but continue praising him as he follows you. Initially, the puppy might seem to question your fascination with this wet stuff, but your attitude will gradually become his attitude. After a few short sessions, he'll love splashing around with you. When you're sure the dog is completely comfortable wading this way, you can move on to the next step: basic swimming. Go to a suitable stream. Why a stream? So you can prevent refusals. If you were to wade out into deep water in a pond, and if your pooch were to refuse to swim out to you, you'd eventually have to return and join him on shore. That would put him in control. The dog would soon learn that if he waits on shore, you'll return to him. In a stream, you can wade all of the way across. Once on the far side, you can encourage him to join you and rely on his separation anxiety to persuade him to jump in and swim over to your side. If necessary, you can continue walking away from him on the far shore, and even disappear, thereby increasing his anxiety. Start working where the channel is narrowest. First, get your puppy comfortable with the new environment by simply wading around in the shallows. When he follows you there as eagerly as he did in the pond, simply wade out through the deep water and across to the far shore. As you do, encourage him to follow you. If he's reluctant, clap your hands, and speak encouragingly to him. Eventually, he'll plunge in and start swimming toward you. Encourage him with all possible enthusiasm. Your pup will struggle frantically, head high, beating the water with his front feet, and his forward progress will be agonizingly slow. But he will eventually reach the shallows on the other side, and splash frantically to you. Squat down and make a magnificent fuss over him. Then walk around on shore for a few minutes to let him catch his breath. Then, wade back across the stream, encouraging him to follow. This time, he'll tag along more willingly. He'll continue beating the water for some time. Eventually, and gradually, he'll settle down and swim smoothly. Go back and forth like this several times, right there where the channel is narrow, before you head for home. In subsequent sessions, repeat this process, moving gradually to places where the channel is wider and wider. Don't forget to praise and encourage him regularly. He has no desire to learn how to swim. He does it only to please you, so don't hide your pleasure from him. When he follows you willingly through the widest part of the channel, he's becoming comfortable. After a few sessions of long swims, he'll gradually stop beating the water. Give him all the time he needs to accomplish it. Don't go to the next step until your puppy is swimming as smoothly as he should. When your little tyke is swimming without beating the water, you can start taking a retrieving dummy along, and using it, but only for very short water retrieves at first. You should start his water retrieving in the still water of the pond, not in the running water of the stream. Actually, you should start out with land retrieves near the pond, just to get him used to retrieving in the general area. Take him to the shoreline, turn around and toss the dummy away from the water. Give him three or four such retrieves before again turning to face the water. Now, control yourself! Toss the dummy only a few feet out into shallow water, where he can retrieve it without having to swim. After two or three successful retrieves in wading water, toss the dummy just a couple of feet out into swimming water. If you've done all the preliminary work described above thoroughly, the puppy will have the dummy in his mouth before he realizes he's swimming. The rest should be obvious. Toss the dummy a little farther out each time for three or four retrieves, and then quit. In the next session, go to a different place on the pond and repeat the process. And so on all over the pond, and all over several other ponds. Hey, take a look: You've got yourself a water dog! 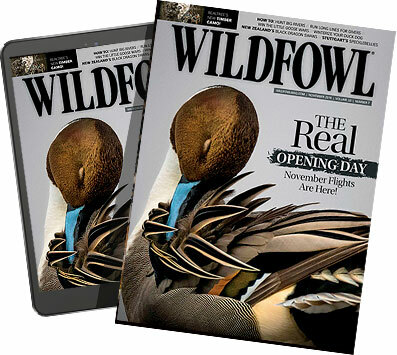 Jim Spencer's books are available from the Wildfowl Bookshelf. Titles are: Training Retrievers for Marshes & Meadow; Retriever Training Tests; Retriever Training Drills for Marking; Retriever Training Drills for Blind Retrieves; Retriever Hunt Tests: A Handler's guide to Success; HUP! Training Flushing Spaniels the American Way; and POINT! Training the All-Seasons Bird Dog.